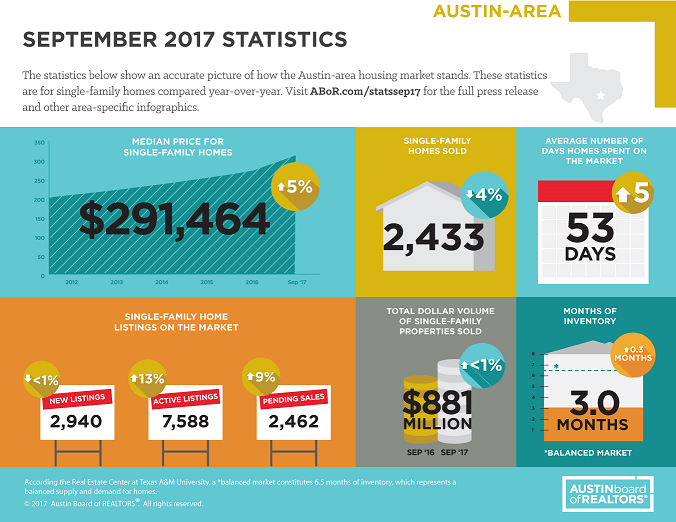 AUSTIN, Texas – Oct. 17, 2017 – Single-family home sales declined across most of the Austin-Round Rock Metropolitan Statistical Area (MSA) in September, while inventory levels continued to increase, according to the September 2017 Central Texas Housing Market Report released today by the Austin Board of REALTORS®. Single-family home sales in the Austin-Round Rock MSA decreased 4.3 percent year-over-year to 2,433 home sales in September 2017. Single-family home sales also declined in most of the counties in Central Texas, with the exception of Williamson County (up 1.0 percent year-over-year to 873 home sales). Home sales declined in Travis County (down 8.6 percent year-over-year to 1,146 home sales), Hays County (down 0.3 percent year-over-year to 299 home sales) and the city of Austin (down 4.1 percent year-over-year to 719 home sales). Home prices in the five-county MSA continued to rise at a steady pace in September. During the same time frame, the monthly housing inventory for single-family homes in the Austin-Rock MSA continued to rise for the ninth consecutive month increasing 0.3 months to 3.0 months. In the city of Austin, median price increase 4.0 percent to $355,000 in September, while monthly housing inventory remained unchanged at 2.4 months of inventory. The increase in housing inventory has led to a recent spike in new and active listings. The Austin Board of REALTORS® (ABoR) builds connections through the use of technology, education and advocacy to strengthen the careers of its 11,000 members and improve the lives of Central Texas families. We empower Austin REALTORS® to connect their clients to the region’s most complete, accurate and up-to-date listings data. For more, contact the ABoR Department of Public Affairs at marketing@abor.com or 512-454-7636.